AMMAN- HE Dr. Talal Abu-Ghazaleh received an official letter from Mr. Haoliang Xu, UN Assistant Secretary General, Assistant Administrator and Director, Regional Bureau for Asia and the Pacific, UNDP extending his gratitude to Dr. Abu-Ghazaleh for accepting the invitation to be a member of the United Nations Social Impact Fund High Level Advisory Board (UNSIF-HLAB). In his letter, Mr. Xu said: "We are honored to have you as part of the Board and we really appreciate your commitment to donating your precious time to serve with us," the letter continues "With the help of your leadership, insights and expertise, we now have an exciting opportunity to answer the universal call to action to end poverty, protect the planet and ensure that all people enjoy peace and prosperity." Dr. Abu-Ghazaleh's selection was based on his exemplary leadership, profound insights and expertise deemed indispensable in enabling UNDP-UNSIF to maximize its overall social, economic and policy value for the government, the UN and the financial sector. Dr. Abu-Ghazaleh will act as a critical advisor and will jointly shape the direction of UNSIF policy initiatives, investment strategy and impact, with an elite of renowned and committed leaders. Earlier, Mr. Xu stated: "Dr. Abu-Ghazaleh's commitment to bettering society, and in particular nurturing youth and expanding opportunities for all, is inspiring. Under his leadership, Talal Abu-Ghazaleh Organization and Talal Abu-Ghazaleh Foundation succeeded in strengthening the minds and hearts of generations to come, setting the foundation for a robust knowledge-based economy." He added: "Your experience with leading a highly successful "hybrid" model of a for-profit organization with a pro-social mission will be invaluable to the United Nations Social Impact Fund that looks to use blended financing to support entrepreneurs around the world as they contribute to a strong and resilient world." 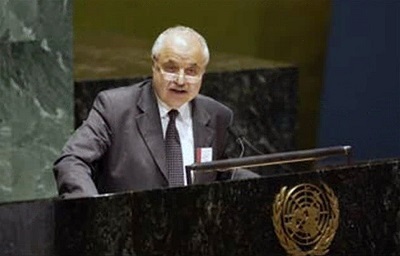 Having served as UN ICT TF co-chair and UNGAID chair, Dr. Abu-Ghazaleh’s consistent adherence to emphasizing the necessity for ICT was further articulated in his declaration that Development of Information and Communication Technology (ICT) and enhancing its use are considered the cornerstone of a country’s economic structure. It is noteworthy to mention that Senator Abu-Ghazaleh has chaired more than 14 UN taskforces and initiatives and he was Vice Chair with Their Excellencies Kofi Anan and Ban Ki-moon of the UN Global Compact as well as being a member of several UN programs, most recently being named Special Ambassador to the World Tourism Organization (UNWTO). In 2016, during the UNDP's celebration marking the 50th Anniversary of its founding and the 40th Anniversary since the start of its operations in Jordan, Dr. Abu-Ghazaleh was honored for his role in advancing the UNDP’s development goals. TAG-Org cooperates with the UNDP on various projects, most notably in the fields of capacity building which aims to achieve sustainable development for Jordanian youth and Syrian refugees. The inaugural meeting of the UNSIF High Level Advisory Board will be held September 21st in conjunction with the UNSIF side event at the United Nations General Assembly meeting in New York. The UNDP-UNSIF supports the financing for Sustainable Development Goals (SDGs) agenda, and was established in November 2016.